For the mech from Metal Gear, see Metal Gear REX. 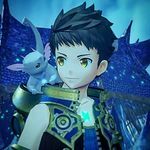 Rex (レックス, Rex) is the main protagonist of Xenoblade Chronicles 2. Rex with Azurda in Xenoblade Chronicles 2. Rex was a 15 year old salvager from Letheria who lived on a titan named Azurda or "Gramps" until a fated meeting with the Aegis Pyra while on a salvaging mission with Jin, Malos, Nia, and Dromarch, but after touching Pyra's sword, Jin kills Rex by impaling him in the heart, and reveals that he leads an organization known as Torna. Rex wakes up in a memory of Elysium and meets Pyra who requests him to take her to the real Elysium in exchange for bringing him back to life. Immediately after being revived, Rex and Malos, Torna's second-in-command as well as another Aegis, battled each other until Azurda rescues Rex and Pyra, as well as Nia and Dromarch who were initially members of Torna but defects to Rex's side. After that, they begin to travel around Alrest starting at Gormott, meeting Tora, Poppi, Mòrag, Brighid, Vandham, Roc, Zeke, and Pandoria, on their journey to reach Elysium while having run-ins with three more Torna members; Akhos, Patroka, and Mikhail. Rex set for Mii Sword Fighter, featuring Azurda. 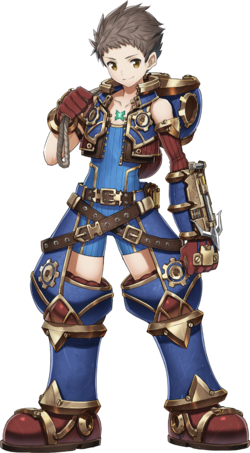 While Rex was considered for the roster, he couldn't be added due to Xenoblade Chronicles 2 being announced after character planning finished (however, it is unclear as to whether this refers to planning for only the launch roster or the DLC roster as well). As an offered alternative, Rex appears as a costume for the Mii Swordfighter. Azurda in his companion form appears in the set's hood. The costume comes free with purchase of the Fighters Pass. Rex also appears as a spirit. Rex's outfit appeared in The Legend of Zelda: Breath of the Wild as an outfit that Link could obtain from the Collaboration: Xenoblade Chronicles 2 DLC. This page was last edited on April 19, 2019, at 04:05.